There’s a moment in the film Rosemary’s Baby where a scene is partially blocked by an open door. In a story that’s been repeated so often that it must be true by now, audience members watching the film craned their necks, trying to peer around the edge of the door.Through the Woods is an equally engrossing experience. There were many times when I felt myself craning my neck, peering deep into dark backgrounds or re-reading panels to try to see further into the gloom. It’s no coincidence that the author starts off the book with a story about being afraid of the dark as a child. Even as you stare into the pitch-black backgrounds you know you’re not going to see anything. But you also know that there’s something out there. 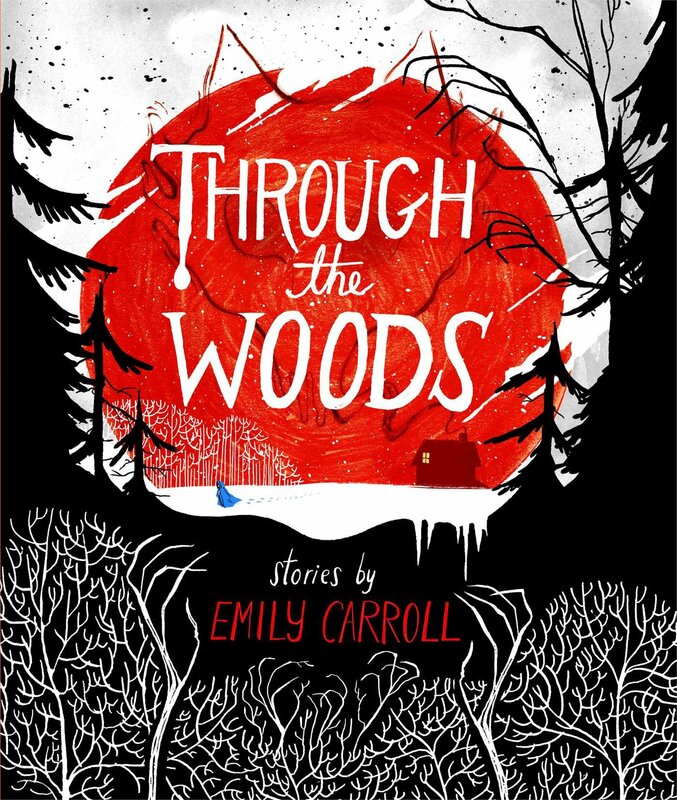 Through the Woods is a collection of short horror comics from Canadian artist Emily Carroll. The five tales (and two bookend pieces) are very much slow burns and in the spirit of Victorian ghost stories. An example of this is the first story in the collection, "Our Neighbor’s House." In it, three young pioneer girls, sisters Mary, Beth, and Hannah, are left home by their father while he goes out hunting in the wilderness. When he doesn’t come back on the third day, instead of setting out for their neighbor’s house like he told them to the girls stay put. After that a tall man with a wide-brimmed hat and an ever-present smile starts coming to the house each night, charming the sisters away one by one. The story manages to marry creeping terror with the drowsy numbness of being stranded and bored, home alone with nothing to do. The colour palette is mostly earth tones and bleak shades of grey, with occasional shots of red as the story comes to an end. What makes the story so spooky is both the aspects of survival horror (each day more supplies go missing) and how it doesn’t explain the supernatural elements of the story. Who is the stranger? What does he want with the girls? We never even get a good look at him, only an arm or half an outline here and there. The only hint we get is from our narrator, level-headed middle child Beth. While her sisters are correct, she says, in that the stranger does have a wide-brimmed hat, and does wear a smile ("indeed, it looks impossible for him to do anything else"), it is obvious to her that he is no man. The next story in the collection, "A Lady’s Hands Are Cold," is my least favourite but also the most visually ambitious. In it Carroll does away almost completely with panel borders, focusing on big images to sweep the reader along. There’s more color here than in any other story, bright reds and blues and yellows that end up looking forbidding and lurid against the black backgrounds and borders. But even though it’s nice to see a different visual style from Carroll, the story itself is lackluster, a ghostly Bluebeard re-tread that doesn’t feel as fresh as the other stories in the book. It also seems out of step thematically. In every other story the evil emerges from the woods (as it says on the back cover: "It came from the woods. Most strange things do"). In "A Lady’s Hands Are Cold" the horror is centered in the home, literally hidden in the walls of an opulent mansion. Instead of forest and nature scenes we get lots of elaborate wallpaper. In this story the main character doesn’t have to get "through the woods." She just needs to get out of that house. "His Face All Red" features a man who has constantly lived in the shadow of his more charismatic brother. When they go out into the woods to hunt a wolf, the man sees his chance to be rid of his brother forever and murders him. Everything works out perfectly, until a week later the brother returns to their small village, alive and without a scratch on him. This is another story that banks hard on ambiguity to create a chilling atmosphere. From the description it sounds like a ghost story or zombie tale, yet it’s neither of those but rather something harder to pin down. I like that ambiguity but also think Carroll pulls it off better in "Our Neighbor’s House." "His Face All Red" does have a great final moment, a panel that manages to act as a cliff-hanger but still provides a great endnote to this tale of fratricide. The next story, "My Friend Janna," is my favourite in the book. Janna is a young woman who can seemingly commune with the dead. People come from all over to speak with their loved ones, but what they don’t know is that it’s all a prank perpetrated by Janna and her friend Yvonne. The girls know that their pranks are malicious and hurtful, but they don’t know how to stop. Things get worse when Yvonne starts to suspect that Janna is in fact haunted by something real. What made this story shine is the girls’ complicated friendship. The drama in this story comes not so much from Janna’s possession but from how Yvonne reacts to it. She wants to warn her friend, but worries that Janna will merely think she’s trying to one-up her, or lying to her just like they’ve been lying to everyone else. The art does a great job of depicting Janna’s deterioration, showing her becoming more and more haggard while the ghostly (alien?) presence around her grows stronger. In one of the best moments in the book, Carroll shows Janna’s fragmented state of mind by devoting a two-page spread to Janna’s notebook, full of eerie ramblings, rhymes, and pictures. The story treads a fine line concerning the presence haunting Janna. While it is in plain sight most of the time, because of its nebulous shape it still manages to stay mysterious (and creepy). My only complaint about this story is Carroll’s apparent need to tell us how Janna came to be possessed, or at least Yvonne’s theory on how this came to be (it is, of course, through something the girls came upon in the woods). While it’s only a small part I think the story would be stronger without it. It also reflects a subtle progression across the book’s five stories with each story becoming more explicit, not just with regard to its scares but with its plot points. This is especially apparent in the book’s last story. In "The Nesting Place," Bell is a teenage girl visiting her older brother and his fiancée out in the wooded countryside. There’s a lot packed into the opening pages: Bell’s feeling of displacement at her boarding school, her mother’s death, and also the odd beliefs her mother passed on before dying, warning her daughter about monsters that burrow themselves inside of you. The comic is basically Invasion of the Body Snatchers, with some otherworldly creature wearing human skin and trying to find more skin-suits for its children. When Bell finally figures this out, the monster comes to her and pleads its case. It’s an interesting contrast to "Our Neighbor’s House" and "His Face All Red" where we are given no insight into the stories’ monsters. There we barely glimpsed the evil lurking in the shadows; here we get to see it in all its gruesome glory. When Bell stumbles upon the monster in its forest lair, it’s a moment so in-your-face that it works not just as a catharsis for this story but for the entire book. Bell is one of the most interesting characters in the collection. Though she is disabled (she wears a leg brace) the other characters don’t treat her any differently because of it (though it does come up in conversation and is acknowledged). It’s nice to see a disabled character whose disability is obviously an important part of their character but not an important part of the plot. It’s also great to see how she handles the monster. Bell turns the tables on the creature not by fighting it but by telling it a scary story, dissuading it from going to the city and infecting more people. It’s a great moment of triumph, though it doesn’t last long: as with any "Body Snatchers" type tale, there’s a "gotcha!" twist at the end that’s par for the genre. The book closes by returning to Emily Carroll’s own childhood, where we see her play the part of Red Riding Hood, travelling through the woods from her father’s house to her mother’s. It’s a very beautiful piece, with Carroll depicting the woods in a way that’s half fantasy forest, half children’s board game (in a nice touch, Emily’s childhood bedroom has the same colour scheme as the classic children’s picture book Goodnight Moon). It’s whimsical in a way that none of the other chapters are, making me hope that Carroll does more stories in this style in the future. But for all its prettiness, the chapter still ends on a dire note, delivering the coda that ties the book together: you need to be lucky every time you walk through the woods if you want to avoid the monsters, but to catch you the monsters need only be lucky once. Through the Woods is a great, mostly cohesive collection of short horror stories that places atmosphere over answers. Because of this some readers might find it frustrating but if you are able to let go of a desire for certainty, there is plenty of room for your imagination to fill in the blanks. Carroll’s art is superb, giving each tale a distinct air (the detail paid to the clothing is especially impressive and really sells each story’s setting). This is Carroll's first collected volume of work, though numerous stories of hers (including "His Face All Red") can be found online. They are well worth checking out if you like subtle but unsettling horror. Shannon Fay edits manga by day and writes fiction by night. She can be found on twitter @ShannonLFay, at her website, and in real life killing it at pub trivia. In My Friend Janna I'm not sure if it's an actual possession, or if the rabbit is there to show how she got rabies.